By registering with us, you consent to the use and method of disclosure as described in this PrivacyPolicy. We [also] collect personally identifiable information when you choose to use certain other features of the Site, including: i) making purchases, ii) consenting to receive email or text messages about upcoming promotions or events, iii) consenting to receive email, iv) participating in our forum, iv) commenting on articles, and others. [Review the preceding list to ensure that it comports with the services offered on your site.] When you choose to use these additional features, we require you to provide your “Contact Information” in addition to other personal information that may be required to complete a transaction such as your phone number, billing and shipping addresses and credit card information.Occasionally, we may also request information such as your shopping preferences and demographics which will help us better serve you and our others users in the future. Our site uses “cookies” and other tracking technologies.Cookies enable us to serve secure pages to our users without asking them to sign in repeatedly.Most browsers allow you to control cookies, including whether or not to accept them and how to remove them. If a user’s system is idle for a defined time, the cookie will expire, forcing the user to sign in again to continue their session. This prevents unauthorized access to the user’s information while they are away from their computer. Third-Party Cookies:In the course of serving advertisements to this site, our third-party advertisers may place or recognize a unique “cookie” on your browser. You may choose to invite friends to join the ConsumerCryptocurrencyExpo.com by sending invitation emails via our invite feature. ConsumerCryptocurrencyExpo.com stores the email addresses you provide so that the respondents may be added to your social network, confirm orders/purchases and also to send reminders of the invitations. ConsumerCryptocurrencyExpo.com does not sell these email addresses or use them to send any other communication besides invitations and invitation reminders. Recipients of invitations may contact ConsumerCryptocurrencyExpo.com to request removal of their information from our database. ConsumerCryptocurrencyExpo.com only uses your personal information for the original purposes it was given. Your personal information will not be sold or otherwise transferred to unaffiliated third parties without your approval at the time of collection. ConsumerCryptocurrencyExpo.com will not disclose, use, give or sell any personal information to third parties for any purposes other than to our suppliers and other third parties who need to know in order to deliver services on behalf of ConsumerCryptocurrencyExpo.com unless required to do so by law. Further, ConsumerCryptocurrencyExpo.com reserves the right to contact you regarding matters relevant to the underlying service provided and/or the information collected. 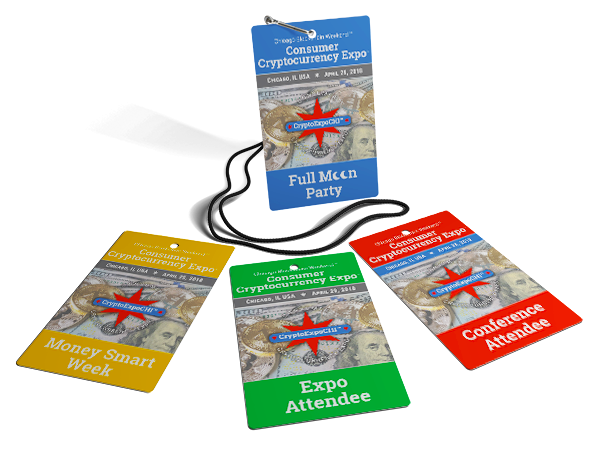 ConsumerCryptocurrencyExpo.com may use your personal information for target advertising toward you based on things such as region, gender, interests, goals, habits, etc. ConsumerCryptocurrencyExpo.com may disclose Contact Information in special cases where we have reason to believe that disclosing this information is necessary to identify, contact or bring legal action against someone who may be violating our terms and conditions of use or may be causing injury or interference with our rights, property, our customers or anyone who could be harmed by such activities. Advertisements appearing on this Site may be delivered to you by ConsumerCryptocurrencyExpo.com or one of our Web advertising partners. Our Web advertising partners may set cookies. Doing this allows the advertising partners to recognize your computer each time they send you an advertisement. In this way, they may compile information about where you, or others who are using your computer, saw their advertisements and determine which advertisements are clicked. This information allows an advertising partner to deliver targeted advertisements that they believe will be of most interest to you. ConsumerCryptocurrencyExpo.com does not have access to or control of the cookies that may be placed by the third party advertising servers of ad partners. We provide mechanisms for updating and correcting your personal information for many of our services.You may modify or remove any of your personal information at any time by logging into your account and accessing features such as edit and account.